If you have ever tried to fit a shelf, window sill, kitchen unit or other object to an odd shaped or uneven surface then you will know this is no easy task. Although you could just push it up as tight as you can to the surface in question, it never looks as good as it could if it was shaped to fit perfectly. If, however, you are totally happy with just pushing it against the surface, that’s totally fine and there’s nothing wrong with that at all, but if you would like that polished, professional finish, then it is possible to shape the item to fit. 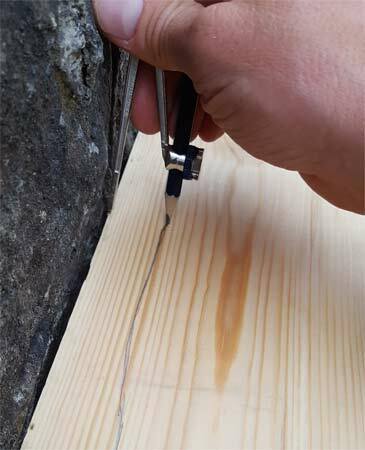 The process of marking a cutting line on an object is called scribing and the verb is described in the dictionary as “marking or scoring with a pointed instrument as a guide to cutting” and this pretty much perfectly describes the process. How Should I Scribe my Line? In traditional woodworking, cutting lines are points or measurement were marked using a bradawl. If you’ve never seen one before, this particular tool looks similar to an ice pick and in most cases, has a shaped wooden handle at one end and at the other, a sharp metal spike that runs down to a fine point. The fine point is used to mark a precise and accurate line or position for cutting up to. Although still a favourite among traditional woodworks and tradesmen, most now use either a pencil or pen. In all honesty it doesn’t really matter what you us, as long as you can see where you need to cut and any marks are fine enough to be accurate, that’s all good. How Should I Scribe to an Uneven Surface? When it comes to the overall success of how well your object, be it a kitchen base unit, shelf or other actually fits against the surface you are matching to, this really depends on how accurate both your marking and cut is. We’ll deal with the marking out first. 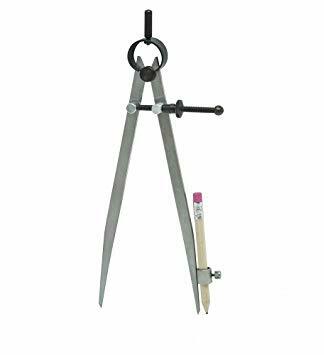 To transfer the shape of the object you are fitting up to on to the object you need to cut, the best tool to use is a compass (or pair of compasses) that take a standard size pencil. See the image below. In general, an engineers compass is the tool to go for as these normally feature a threaded adjuster that allows you move the legs to a set width and keep them there. Next, you will need to position your object up to the surface in the exact place it is going to reside in. Make sure it is as flat and level as possible. You may need a second pair of hands at this point in order to hold the item in place while you mark it. If you have help available, make use of it. Don’t struggle as you could make mistakes that will affect the overall quality of the job. With your object in place, take you compass and place the non-pencil end against the uneven surface and the pencil end over your object, with the pencil in full contact with the surface. Make sure you starting at one end and working towards the other. Ensure that the pencil scribes a full and clear line as you go. Take your time and most importantly, don’t rush! Once you have reached the end, you should then have a full and clear cutting line to follow. As I’m sure you have gathered, the overall success of this job is really down to how accurate your cutting line is, so take your time and follow every detail in the surface. If the above has inspired you to do some scribing of your own then check out our project on scribing to uneven surfaces here for even more tips and details.